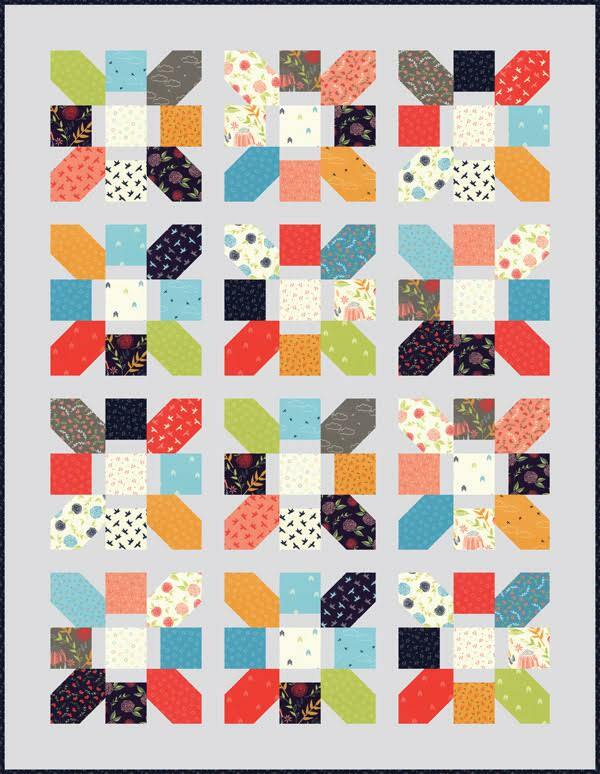 I am so excited to be a part of the latest hop for the Fat Quarter Shop's Shortcut Quilt Series! Jolly Bar Jazz is a fun twin sized quit made from two Jolly Bars and yardage. 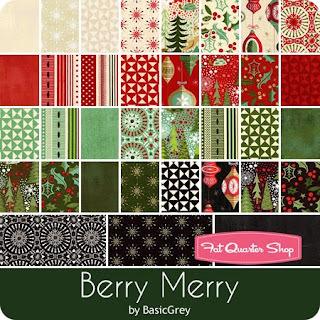 For my version of this quilt, I chose the newest Christmas line from Basic Grey - Berry Merry. Instead of using traditional 40" yardage for my background, I used a grey 108" wide backing fabric in the Basic Grey Hits the Spot pattern for my background. I had a little bit of trouble initially cutting from such a large piece of fabric, but in a little bit had no problem at all! I used the red version of the same fabric for my backing and binding. I pulled out the lightest prints for my block centers and separated the rest of the fabric for the corner units (Block A) and the side units (block B). To make Block A, you sew strips to your Jolly Bar and then trim to a 6.5" square. The rest of the piecing is just straight seams! Isn't the spotted yardage a fun background? This quilt top went together so fast! As for the quilting, I did large curls over the entire quilt. As mentioned above, I used the backing for the binding. My finished quilt is full of Christmas cheer! Check out the video from Kimberly! The original quilt and kit available from FQS is featured in Creekside by Sheri and Chelsi. The pattern itself, though, is F-R-E-E! Click here to get the PDF! 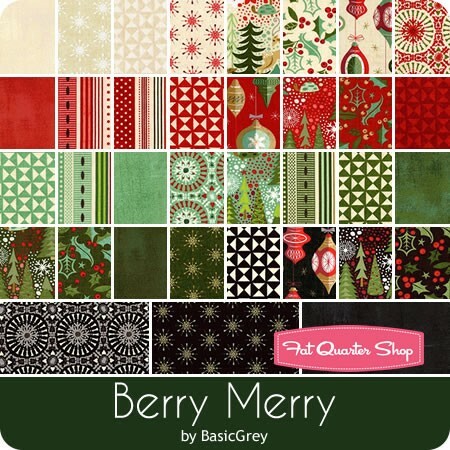 I'm very excited to give away TWO Jolly Bars of Berry Merry to one lucky winner -- just add in the background of your choice to make your own Jolly Bar Jazz quilt! 1. Visit the Fat Quarter Shop and browse the Jolly Bars in stock -- leave me a comment with which ones you would use to make your own version of this quilt! 2. Followers get a bonus entry - if you follow me (Instagram, Facebook, Bloglovin, whatever) tell me how you follow in a second comment. Not a follower? You can also earn a second entry by sharing on social media in whatever way you chose. 1. One prize = two jolly bars, shipped worldwide. 2. Maximum of two entries per person; I must have some way to contact you for you to be able to win. 3. Random Number Generator used to determine the winner. 4. Giveaway will close at midnight on October 2nd and winner announced shortly thereafter. Update: the giveaway is now closed and the winner is KUpton! Don't forget to check out all of the other bloggers participating in this hop! Linking up with Finished or Not and Finish it up Friday! It's official -- my Top Spin quilt is over the hill! It's made it to 40 blocks! I took a break from my other projects (since I'm already done with all of my deadlines for this month!) and made sixteen more Top Spin blocks (pattern here). That brings my block total up to 40 blocks of the 48 blocks that I need to make for a twin sized quilt. Looking through my stash, I have two two-yard cuts in similar colors that I'll be able to use for the backing. I will likely have to add in a little something to get the backing to be big enough for a 72" x 96" quilt but that should be a relatively easy task. This also means that I'm just about to the end of my leader and ender project! I am going to have to consider what I'd like to start as a leader and ender project or which of my WIPs would work to be a leader and ender project. This weekend was a "Sew-in weekend" for me (other than my normal weekend chores) since my husband had to work both days. I have lots of progress to show you this week, including a finished quilt (!!!) on Friday AND a giveaway. The first thing I worked on this weekend was my Rainbow Scrap Challenge project. I had actually cut out the "sidings" for my orange houses all the way back in July when I needed to use orange strips in my Stash Bee blocks. I still needed to cut the rest of the blocks. I've gotten to the point where I've memorized the cutting directions! This brings my block total up to 38! I think that I will need to go back through and make one more block in each color to bring my total up to 48 for a 72" x 96" twin sized quilt. Next month is our last month with a color theme for the Rainbow Scrap Challenge and it will be pink, I think, since we haven't made pink blocks yet. I'm also excited to share about a finish that I had a little part in! My sister's best friend from birth is getting married in November and my mom, sister, and I worked furiously in secret to make blocks for a quilt! Amanda did all of the cutting, we each sewed about one-third of the blocks (I did the darker green ones! ), and my mom quilted it. The pattern is Ombre Gems by Quilty Love. Sharing at Oh Scrap, Linky Tuesday, and Scrap Happy Saturday! Update: The giveaway is now closed and the winner noted below! Please stop back on 9/29/17 for another giveaway! Today I am sharing a new project tutorial featuring Meadow Dance by Amanda Murphy on the Sew In Love With Fabric blog! As I might have mentioned before, Amanda Murphy is probably my favorite designer so I feel so lucky to be able to participate in another one of her blog hops with Benartex! I decided to challenge myself to make something new and am very happy with the results! 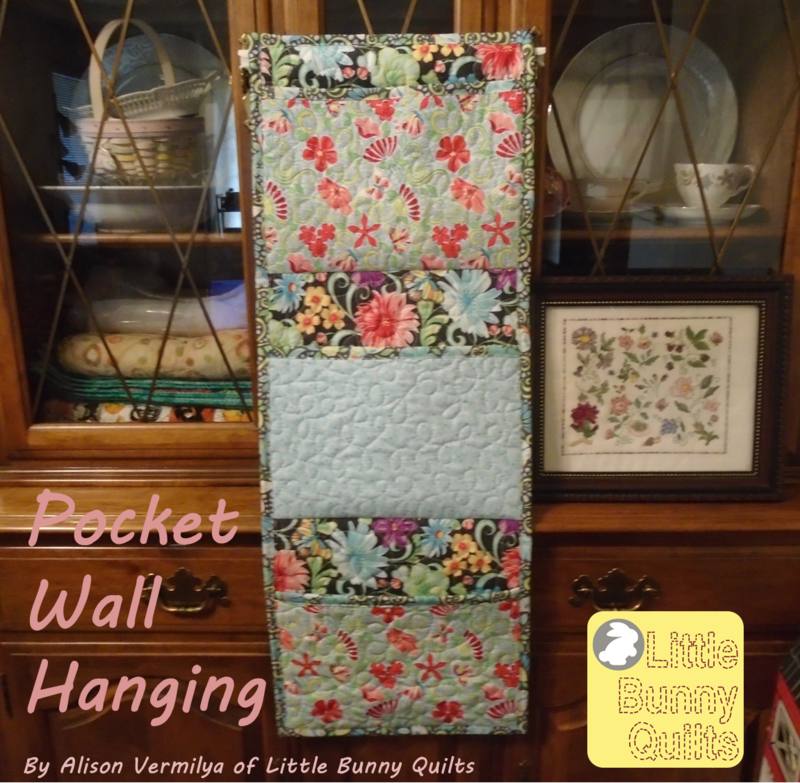 Rather than being a pieced and quilted project, this project uses quilted sections to build a rather simple wall hanging with pockets! Note: This is more that sufficient fabric for the wall hanging made below, but in case you want to scale up or make a mistake, I wouldn't start with less fabric than this. I found it was easiest to oversize my quilted sections and cut down to my desired size. For the main background/base of your wall hanging, you will need a piece of fabric for the "front" and the "back" as well as a piece of batting. My desired size was 12" wide by 32" long, so I cut my pieces all an inch larger. Layer your backing, batting, and main fabric and quilt as desired. Trim to the desired size of your wall hanging. I quilted mine with loops and trimmed to 12" x 32". Repeat this process for your pockets. My three pockets are 12" x 8", so I cut my pocket fabrics and batting approximately 13" x 25". I found it to be easier to quilt one larger section and cut it into the three sections I needed for my pockets than to make three sections individually. Cut four 2.5 inch strips for binding and for finishing the raw edges. Since my pockets are 12" wide, I cut one WOF binding strip into 14" strips for covering the top raw edge on each pocket piece. I sewed the strip to the piece exactly as I would for regular binding and trimmed off the excess. Repeat for each pocket. You do not have to worry about the raw edges on the bottom and the sides as these will be covered by the final binding. Don't forget to add some sort of hanging pocket! I used a 11" by 5" rectangle to create my pocket. Add binding around the edge of your wall hanging just as you would any project -- I needed three strips for my wall hanging. There are times that you will be sewing through 3 layers of batting and 6 layers of fabric -- you will want to consider using your walking foot and sewing slowly! I also found it helpful to try to space my binding seams in places that did not have multiple layers of batting. Hang as desired and fill with whatever your heart desires! While I made this with bright cheerful fabrics, it would be a great way to make a Christmas card holder as well! It's easy to start with this basic shape and modify it for whatever purpose you desire - you could modify this with smaller pockets to hold jewelry or larger pockets for sorting paperwork. Leave a comment to enter to win some fat quarters of Meadow Dance for yourself! 1. Leave a comment on the blog telling me your favorite print from the Meadow Dance collection! Mine is the Garden Path in grey that I used for the binding. Two entries maximum per person, giveaway will close Sunday, September 25th at midnight! Good luck! The giveaway is now closed and Lelia is our winner! Today is the first stop on the hop, and there will be three more posts (and three more giveaways!) so don't forget to visit the other bloggers on their days! Also sharing at Linky Tuesday and Finish It Up Friday! For my second entry, I decided to share my Mystical Mermaid quilt. This year I am an Island Batik Ambassador and this project was made as one of my monthly themed projects. April was our month for an applique project and I decided on making a baby quilt with a mermaid outline for a coworker's new baby. I decided on using our Ready, Set, Soar! pattern and to create my own mermaid applique pattern from clip art. (Details here!) The base fabrics were ones that I chose that fit my "under the sea" theme -- including some prints with shells! For the machine applique, I used a small blanket stitch around my mermaid. I will say that this is the most detailed machine applique project I have done to date -- I have done quite a bit of machine applique in other projects but I really had to slow down and adjust my piece more frequently than in the past due to all of the detail in the mermaid. I think a smaller stitch length helped maintain the level of detail, but it did take much more time. The result is beautiful, so I will say it was time well invested! For the backing I used a batik from my stash that is mainly navy with rainbow accents. I quilted this all in one day -- the off-white section is a bubble meander, and the stripe sections are a clamshell, or really, mermaid tail scales! For the quilting, I did the off white section first, and then did the clamshell quilting. I bound this with the same navy + rainbow batik as the backing! Hello, Ariel! My Disney-loving coworker absolutely loved the quilt for her little girl! I am anxiously waiting for a picture of the new Little Miss with her quilt! Thanks for stopping by and reading about my quilts! 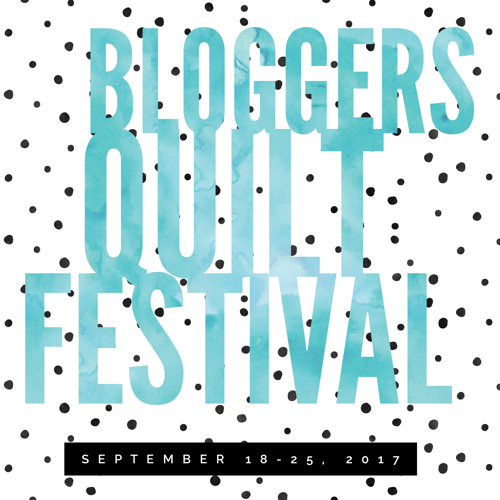 Don't forget to visit the Blogger's Quilt Festival for all of the lovely quilts! 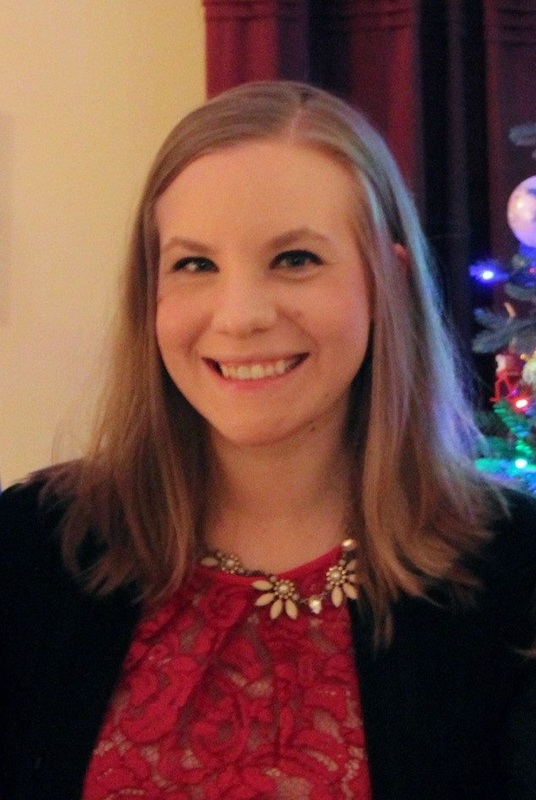 You can visit my first entry here! For my first entry, I decided to share my Clover Sunshine Sampler quilt. This was sitting as a WIP on a shelf for a very, very long time and I finally buckled down and got it quilted in June of this year. As indicated by the name, all of the prints used in this quilt are from a fat eighth bundle of Alison Glass's Clover Sunshine line. Most of the blocks used in this quilt were featured as tutorials on my blog during a quilt along in Summer 2014. You can read a little bit about my process of starting to quilt this quilt here, and quilting this baby in the way that I envisioned took a lot of patience and quilt wrangling. The further I moved out from the center, the easier and easier quilting this quilt became as far as moving the quilt. It is about 70 inches square -- so a rather large throw -- so working on the center blocks was rather difficult. Finally getting to the edges was cause for celebration! I didn't count the rings or sew my spirals to a particular width or size -- I mostly just kept continuing the spiral until it filled in the "nooks" left by my previous spirals. The spirals don't equally overlap because the blocks are not perfectly arrayed in the quilt. I also had to add in a few "tiny spirals" along the edges to fill in some open spaces as well, as you can see in the pictures above and below. This quilt had the most threads to bury of any quilt I have quilted to date. My diagonal strips all go in the same direction and almost nearly match at the seams! It has a beautiful texture. I added in the pink half yard of Summersault from my stash since my quilt math was ever so slightly off on the small side when I ordered my backing fabric. Whoops. 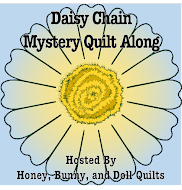 Thanks for stopping by and reading about my quilts! 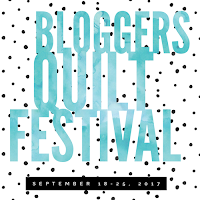 Don't forget to visit the Blogger's Quilt Festival for all of the lovely quilts! You can visit my second entry here!